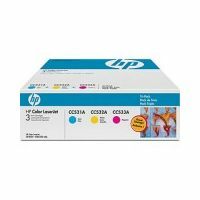 Create your own HP LaserJet CP2025 color toner pack / bundle with our flexible quantity discount pricing. Mix and match products so you are only purchasing what you need, but also maximizing your savings. Remanufactured Cyan Toner Cartridge with 2,800 page yield. Equivalent to HP part number(s): CC531A, 304A Cyan. Fits the following model(s): HP CP2025, HP CP2025dn, HP CP2025n, HP CP2025x. Remanufactured Magenta Toner Cartridge with 2,800 page yield. 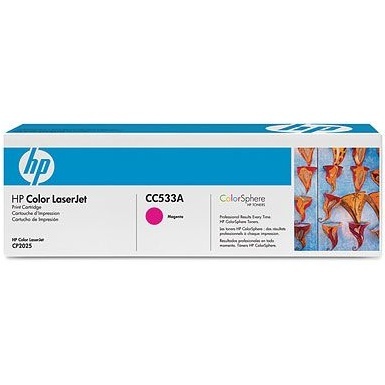 Equivalent to HP part number(s): CC533A, 304A Magenta. Fits the following model(s): HP CP2025, HP CP2025dn, HP CP2025n, HP CP2025x. Remanufactured Yellow Toner Cartridge with 2,800 page yield. Equivalent to HP part number(s): CC532A, 304A Yellow. Fits the following model(s): HP CP2025, HP CP2025dn, HP CP2025n, HP CP2025x. Remanufactured Black Toner Cartridge with 3,500 page yield. Equivalent to HP part number(s): CC530A, 304A Black. Fits the following model(s): HP CP2025, HP CP2025dn, HP CP2025n, HP CP2025x. Buy our high quality compatible toner for HP LaserJet CP2025 with confidence. Join thousands of happy customers who have found our compatible products are equivalent in page yield and print quality. For our compatible products, we offer a 100% Satisfaction Guarantee allowing you to return products within 6 months if you are unsatisfied. 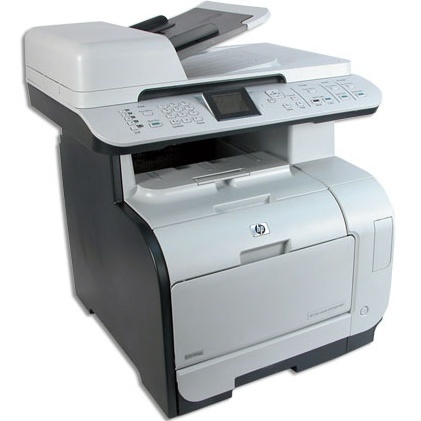 Even though the HP LaserJet CP2025 is a color laser printer designed for the small office buyer, one may be surprised at how large the machine is compared to home based HP toner printers. It is not overly bulky, but is also nowhere near the most compact in its class. What you do get for its size, however, may be worth the trade. It delivers fast print speeds of up to 21 pages in both color and monochrome. 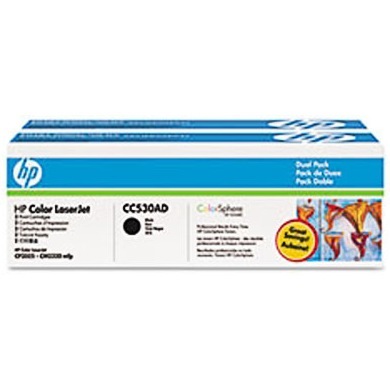 Larger printer toner cartridges also provide more economical prices, and HP CP2025 toner is very inexpensive. The machine also has a large paper capacity of 250 sheets in the main tray, plus an additional 50 sheets in the multipurpose tray. Having a multipurpose tray can be of great advantage to those users who frequently need to use a different size of type of media than what is traditionally loaded in the main tray. Instead of emptying the main tray before printing, users can simply keep the alternate media loaded and ready for printing in the second tray. The unit measures 12.7 inches by 15.9 inches by 19.1 inches and weighs a hefty 52.7 pounds with the printer toner installed. As mentioned, it is not overly large, but it may not be compact enough for very small spaces. Buyers are advised to measure before purchasing due to its footprint taking up a fair amount of space. HP CP2025 toner cartridges are easier to replace than most. The front panel opens to a tray which can slide out for replacing LaserJet CP2025 toner easily. This is preferable to the color toner cartridges being buried inside the machine. With their large capacities, LaserJet CP2025 toner cartridges have a very low cost per page that will save money with every print. There are a few models available for different needs. The CP2025n includes networking, the CP2025dn adds duplexing, and the CP2025x adds all of the above, plus more paper capacity. 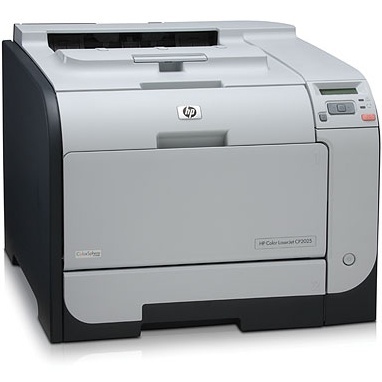 With many configurations to choose from and fast speeds in both color and monochrome, the HP LaserJet CP2025 is an excellent color laser printer. As long as its extra size isn't a concern, its low price and affordable toner are great for your office's budget. Paper jams frequently in the HP Color LaserJet CP2025. The paper length and guides were not set properly. Too much paper was loaded in the tray. Make sure the paper is below the maximum stack height mark. Paper was not stored properly (i.e. too humid). This can cause the paper to become damp and not feed properly into the printer. The paper you are using is too thick. The print is light or faded on the paper. Your HP toner cartridge(s) may be low on toner. Check the cartridge levels by printing the Supplies status page and replace any cartridges that are low in laser toner. It is possible you have a defective cartridge. The print density settings on the printer may have gotten changed. Make sure to set print density to 0. Your printer may need to be calibrated. From the printer menus, select calibration.